My family has so much to be thankful for. Between a loving family and a fun job we get to check out new toys and games on a fairly regular basis. But I have to be careful because I don’t want the boys to think they are entitled to all of these “things” on a regular basis. Granted, many of our toys are actually hand-me-downs from friends and family, but they’re all new to them. This year, I decided to get Oscar involved in a little toy purge. I told him that some kids don’t get to have new toys during the holidays and wouldn’t it be nice to share some of ours? He happily agreed and we went around the room choosing items to donate. When all was said and done we had more than two trash bags full of toys! 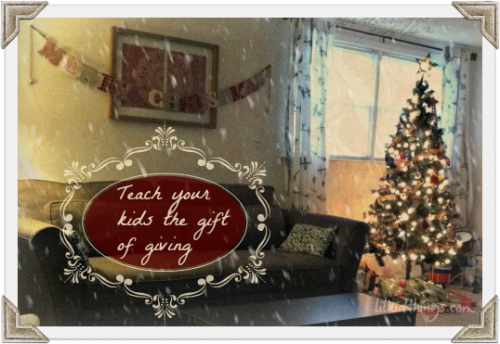 I want to foster that generosity in our boys and remember that giving has always been and will always be better than receiving. This year we have new and gently used items to donate. There are a few ways to help others during the holidays. And I think it’s beneficial to take advantage of all of them. On the one hand, I think it’s wonderful to give of your own possessions. These things have meant something to you or your kids in the past and I think it’s good to part with the stuff that we don’t need. This is especially good for younger kids who have no concept of money. They don’t know what $10 is but they can see that truck will no longer be sitting on the shelf. That said, I also think it’s a good idea to give some money or purchase a few gifts brand new. Parting with used items is one thing, but spending your money is quite another. The amount isn’t as important as the act of giving. I’ve put together a few resources to help you decide what is best for you and your family. Donate gently used toys: There are a few options for donating gently used toys. Remember to put the emphasis on the word gently. This means in nearly new and working condition. You can always donate items to Goodwill, but during the Holidays I prefer to skip the middle man. New and used toys are accepted at Toys for Tots drop-off locations. To find a toy drop near you, check the donation page. If you have an abundance of plastic toys, Second Chance Toys will welcome them with open arms. Make sure they are in clean and working condition and if they require batteries please include them. To learn more and donate, visit Second Chance Toys. 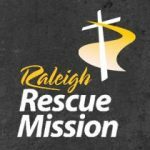 For those of you in the Triangle, the Raleigh Rescue Mission is a great place to donate new and used items locally. They accept almost any household items with toys included. To see a list of what they can accept visit the Raleigh Rescue Mission donations page. Donate financially: Any of the above organizations will also accept financial donations online if you would like to give in that way. You can also purchase toys new and leave them in donation bins before you exit many stores (such as Walmart and Toys R Us among others). This could also be a fun activity to do with your children. Take them shopping with you and let them help you pick out the items to donate. Remember the International Community and help where the needs are greatest by shopping the Samaritan’s Purse Holiday Gift Catalog! You can choose from items like food, medicine and even drinking water to give to families in need. The catalog is a vibrant color PDF that you can look at with your children and decide how you would like to help. 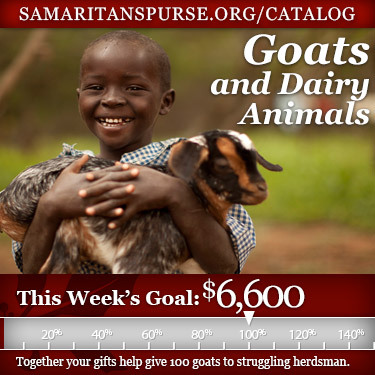 Place your orders and check out the catalog on the Samaritan’s Purse website. 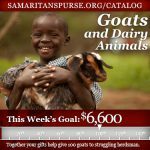 And for a $70 donation, you can even give a family their own goat! A gift like that will go a long way. I know there are countless other ways to get your kids involved in Holiday giving, but I think this is a good start. Those with older kids can volunteer their time with these and many other organizations to help these great projects. And remember, you can give any time you want! What are some ways you teach generosity to your children? This is so important. Thank for sharing some great agencies that could really use help this time of year. Great post! My kids donate to Toys for Tots every year and we usually adopt a family from a letter to Santa.